Discover the New Star difference when you hire New Star Janitorial to keep your commercial property looking its best. We don’t cut corners, we clean them! Since 1998, we have been providing a full spectrum of janitorial services to organizations throughout the Chicagoland area and Northwest Indiana. 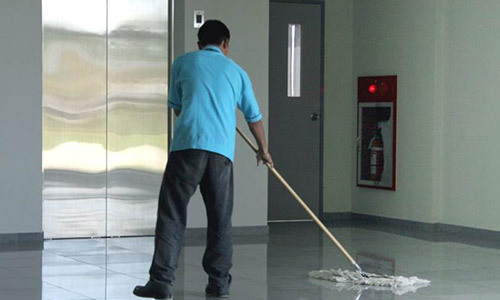 Our janitorial team members are pre-screened (including a criminal background check), receive 6 weeks of in-class and on-the-job training, and are driven to exceed your expectations. Whether you have short-term cleaning needs, or are looking to design a long-term janitorial solution, our staff will work with you to create a customized package that identifies the most cost effective ways to achieve your goals without compromising quality. Unlike many industrial cleaning services, with New Star, no job is too big or too small. The majority of our customers have been with us for 5 or more years due to our high quality work and responsive customer service. When you hire New Star Janitorial, you are entering into a partnership with an agency that serves hundreds of individuals with developmental disabilities. Doing so offers your organization several distinct advantages.